Since 1952, Weber has been manufacturing some of the best grills on the market. As each year passes, their grills really seem to take it to the next level, earning them the well-deserved title of “Epic Grill-maker”. Their quality and innovation is on another plane and any griller with a Weber will find him/herself in grill heaven. Something you may not know is that not only is Weber responsible for some of the best fully-functioning traditional backyard grills, they also produce top-of-the-line portable gas grills, perfect for tailgating or barbecuing off the beaten path. Looking for something compact and powerful to take with you on just about any adventure? Look no further. Enter our personal favorite, the Weber Q Series Portable Gas Grill. The Weber Q Series is best-known for it’s convenience and portability for users. You can have all the fresh and flavorful grilled meals you love, pretty much anytime and anywhere. You’re no longer chained to the backyard, the world is now your grill playground. The Weber portable grill is also incredibly easy to use, as well as compact and fully loaded with all the top features you just can’t compromise on. It’s cooking system comes in three simple, yet masterfully-designed components: the grill grates, burner tubes and grease management system. The Q series has a simple design, but has durable construction, made primarily of high-quality cast aluminum. The cooking grates are the exception and are made of top of the line porcelain-enameled cast iron that can retain heat evenly and sear your meat to perfection, leaving beautiful sear marks despite it’s more compact size. This grill requires minimal care and maintenance as it also has it’s own grease management system. The grease management system consists of an angled grease tray and catch pan where the juices that drip off the meat will funnel down and into the pan. It is placed at a safe distance from the burner tubes to prevent the grease from catching fire. The tray easily slides out for cleaning and when the catch pan starts to fill, you can simply remove the disposable drip pan and replace it with fresh one; making it fast and easy to clean and keeping the grill in great working condition. Even though it may look like it has a simple design, the Weber Q Series design geniuses carefully thought through every construction detail, for example, the shape of the cook-box when fitted with the cover, allows for the ideal circulation of heat around the food for even, consistent cooking of anything you throw in there. The burner tubes are made of high-grade stainless steel, which can withstand the assault of small amounts of water that can be found in liquid propane and natural gas. Weber made these burner tubes to last, they are stronger and more resilient from rust and burn-through than just about any other option available. The burners are also thoughtfully spaced to provide heat across the entire cooking grate. The burner valve has tons of control settings, so you can fine-tune the heat levels to finesse any cook order: medium, rare, medium-rare, you know how picky eaters can be. This grill can also be cleaned with ease using the Weber stainless-steel grill brush. While it’s clear that Weber makes superior portable grills, the large selection they offer can make choosing one of their models tricky and confusing; this is why we provide an in depth scrutiny of what they have to offer, focusing on the Q Portable Series. There are other 2 grills fueled through an electrical cord, but we are narrowing our picks down to the gas grill models of the Weber Q Series. We created a comparison chart of the Weber Q Portable Gas Grill units, so you can do a side-by-side comparison of their features and use this data to decide which of them fits your needs the best. Our handy comparison chart of Weber Q portable gas grills is divided into categories for type of cooking system, cooking area, construction materials, features, specifications and price. Among the four Weber Q models that don’t have wheels and are fit to use as a tabletop gas grill, the Q220 has the best value for its features. It is the original and flagship of the Q-line of portable grill. By giving up a few extra bucks, you can have all the features of the lower Q models (Q100, Q120 and Q200) in this newer Q release. The cooking size of 280 square inches is top of its class and large enough for a family to enjoy perfectly grilled meals. The heat output of 12,000 BTUs is a little lower for the size, but it’s still high enough to grill your meat and sear steaks beautifully. It also has its own built-in thermometer and electronic ignition for a convenient start, allowing you to easily and quickly monitor the food you’re cooking. 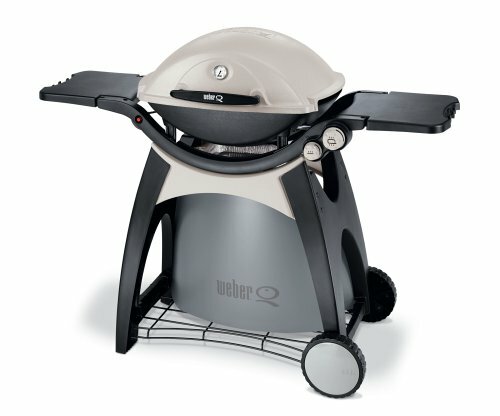 If you still have a few extra bucks in your budget, you might also want to consider the Weber Q300. The Q300, unlike the Q220, comes with roller wheels for better portability, making it faster and easier to move around. It has more features to enjoy, including a larger cooking surface of 393 square inches. Although it doesn’t have warming rack, and has a smaller cooking area compared to Q320 unit, it’s actually well-appointed and has a great heat capacity of 21,700 BTUs, which is more efficient for this size, as compared to the larger 462 square inches cooking area of the Q320. Another feature that we enjoy, in particular, is that the Q320 can use up to a 20lb liquid propane tank and like the Q220 has bonus features like the push-button ignition and built-in thermometer for a more convenient, easy grilling experience. 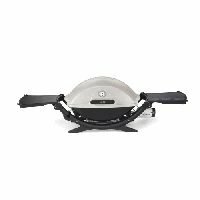 The Weber Q300 also got a user rating of 4.6 out 5 and can be usually purchased at a lower price of $349 on Amazon, which is a great discount to the listed price in our chart. All in all, the Weber Q300 is our top pick of the Weber gas grills for the Q Series. Weber has recently released more grill models for this line-up, which you can read about on the Weber Q gas grills II . •Electronic ignition rarely light the stove, while a match does almost immediately. •When grill gets too hot and stays hot too long, the aluminum shell screws to the nylon frame, melts the nylon, making the grill sag down an inch. decided to check out your website on my apple iphone during lunch break.